Aretha Franklin, the queen of soul and 20th century pop titan who died Thursday at home in Detroit, had a special connection to the Bay Area's radical history. Franklin, whose "Respect" became a civil-rights anthem, connected with the Black Power movement in the Bay Area. In a 1971 Jet magazine interview, she offered to pay the bail of Angela Davis, then imprisoned after eluding arrest for alleged ties to a courtroom escape-turned-shootout in Marin. “Angela Davis must go free,” Franklin said. “Black people will be free. I’ve been locked up... and I know you got to disturb the peace when you can’t get no peace. Jail is hell to be in. I’m going to see her free if there is any justice in our courts, not because I believe in communism, but because she’s a black woman and she wants freedom for black people. I have the money; I got it from black people." Franklin noted that her father, the preacher C.L. Franklin, did not approve of her position. "Well, I respect him, of course," she said, "but I’m going to stick by my beliefs. Angela Davis must go free. Black people will be free." The next year, Franklin wrote a letter to Black Panther Party Minister of Culture Emory Douglas, expressing her regret that due to timing issues, she couldn't appear at a fundraiser for the Oakland-headquartered organization. "I love what you are doing in the community, and I am looking forward to meeting all of you," she wrote. Davis told The Nation this week that Franklin was among her most high-profile supporters. "Her bold public call for justice in my case helped in a major way to consolidate the international campaign for my freedom,” Davis said. Franklin's connection to the Bay Area was also cemented in her concert appearances over the decades. As a teenager in the 1950s, Franklin performed at the Oakland Civic Auditorium (later named for industrialist Henry J. Kaiser) as part of a gospel revue led by her father. The event, promoted by Mel Reid of Reid's Records in Berkeley, yielded her classic recording, "Precious Lord, Parts 1 and 2." In 1967, after making her San Francisco debut at the Jazz Workshop in North Beach, she returned to the Oakland Civic Auditorium as a headliner near the height of her secular stardom. In 1971, storied promoter Bill Graham brought her to his Fillmore West in San Francisco for three nights, a recording of which was released on Atlantic Records that year as Live at Fillmore West. Album highlights include her crossover covers of Simon & Garfunkel and Beatles, done as stomping, gospel-tinged funk, and a 19-minute duet, "Spirit in the Dark," with surprise guest Ray Charles. Franklin performed several times at the Circle Star Theater in Santa Clara, but between the years 1978 and 2014, a fear of flying kept Franklin from performing in the Bay Area entirely. 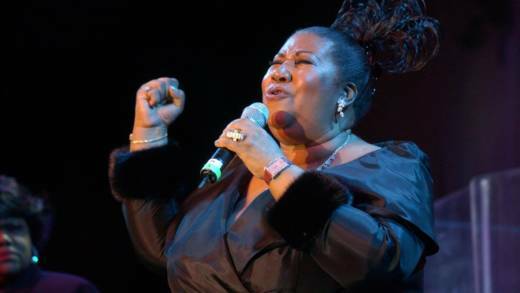 She finally returned after nearly four decades for a concert at the Oracle Arena.